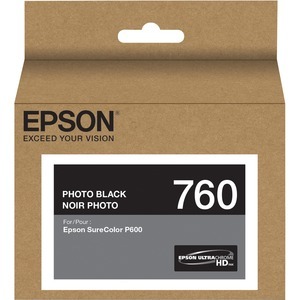 Photo Black Ink Cartridge is part of a convenient nine-cartridge team that helps you achieve exhibition-quality prints in your Epson SureColor P600. Representing Epson's next generation of photographic ink technology, the UltraChrome HD ink resets the standard for photographic imaging excellence. It utilizes innovative core pigments - including this Photo Black pigment that is 1.5 times denser than Epson's previous generation - to deliver photographic clarity, optical density and vibrancy. Individual 25.9 ml. ink cartridge offers even greater productivity.